The Parish church of Kilcavan is situated in a circular graveyard within the Barony of Bargy. The Parish is named after St Cavan-Caomhán Santleathan-of Ardcavan. There are various traditions associated with St Cavan. One of them connects him to St Athracht of Killaraght, Co Sligo, another connects him to St Brendan of Birr. In another tradition he is said to be a half brother, through his mother, to St Kevin-Coemgen-of Glendalough. This would mean he is also the St Caomhán we associate with Inisheer. The church consists of a 13 metre long nave and 7 metre long chancel. The walls are complete except for the north wall of the nave. The west wall has a double bellcote, the top of which is missing and a rounded arch, in the east wall of the nave, leads to the chancel. 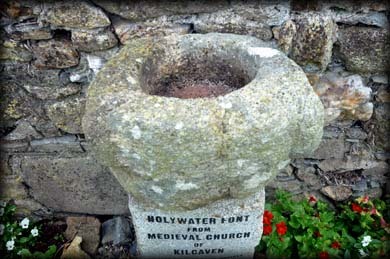 To the south of the church is a large, bullaun like, font mounted on a pedestal. 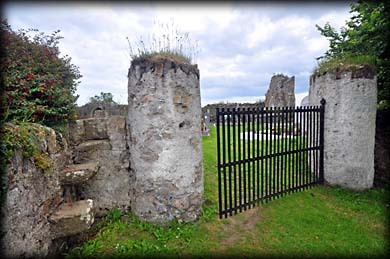 Situated: Kilcavan church is located approximately 500 metres south of Kilcavan Castle. Discovery Map 77: S 8813 1293. Last visit June 2016.